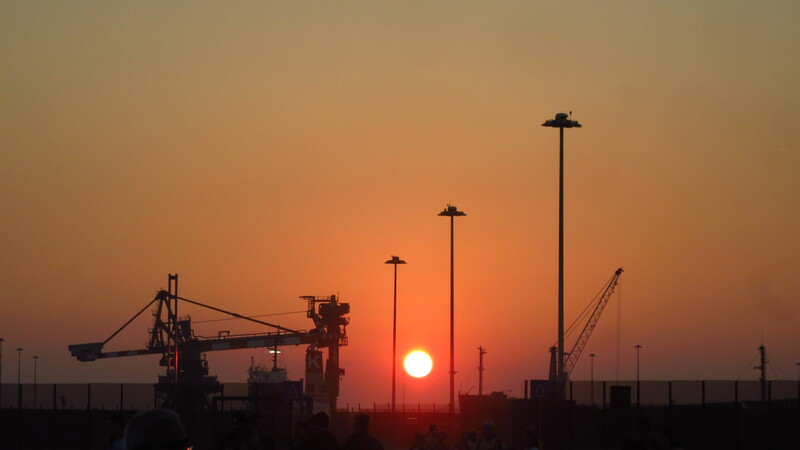 The ferry reached Brindisi at 6:00, just as the sun was rising behind the huge cranes of the dock. I rolled out of its belly, parked by the exit and offered everyone who was driving off the ferry a strip-tease show as I took off the clothes I had worn for the voyage and put on the riding gear. I had to be in Civitavecchia by 20:00 at the latest in order to get the tickets and board the 22:00 ferry to Barcelona, but after my experience in the Igoumenitsa port terminal I preferred to get there earlier than that, so I had decided that for the first and only time in the whole trip, today was going to be an all motorway day. I rode out of the dock, quickly left behind the always ugly area around a port and soon was on the motorway. 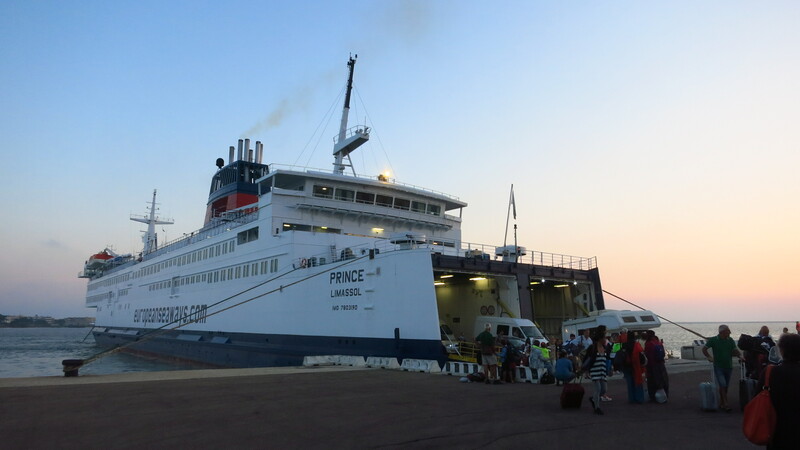 I was starting the day already tired – had not slept much on the ferry, it was too hot and noisy, so I decided to stop often and take it easy. Compared to the roads and motorways I had used in Greece, this autostrada made Italy look like Switzerland – perfect tarmac, civilised drivers (yes, in the south of Italy), free Wi-Fi in all petrol stations and rest areas… The landscape was not bad either, particularly in the central part of my journey, when the motorway crossed between two natural parks, the Parco Regionale di Monti Picentini and the Parco Nazionale di Cilento Vallo di Diano. From there it went down to Naples, around it and all the way to Rome. I kept a steady 100km/h, without accelerating hard to overtake slower vehicles, letting the bike coast downhill with very small throttle openings, anticipating other driver’s manoeuvers to avoid braking, etc. It was boring as hell, but riding on the motorway always is, so going faster or riding more aggressively was not going to make much of a difference. Anyway, at about 19:00 I was just two kilometres away from Civitavecchia when the reserve warning light came on. On normal use this usually happened between 270 and 300km. This time it was at 383km. I had achieved an indicated 4.4l/100km average consumption, and according to the on board computer estimate, I could still go on another 66km, although that number tends to be rather optimistic. The terminal building in Civitavecchia was much quieter than in Igoumenitsa, there were no queues, the Grimaldi offices were clearly indicated, there were seats everywhere, and there was free Wi-Fi. Well, for the first 15 minute. I got the tickets and waited around for about an hour, when boarding began. Again, the motorbikes where first to get on board, so I managed to get a good spot with a power socket and settled down to watch a film and spend the night. Tomorrow afternoon I would see Barcelona again. 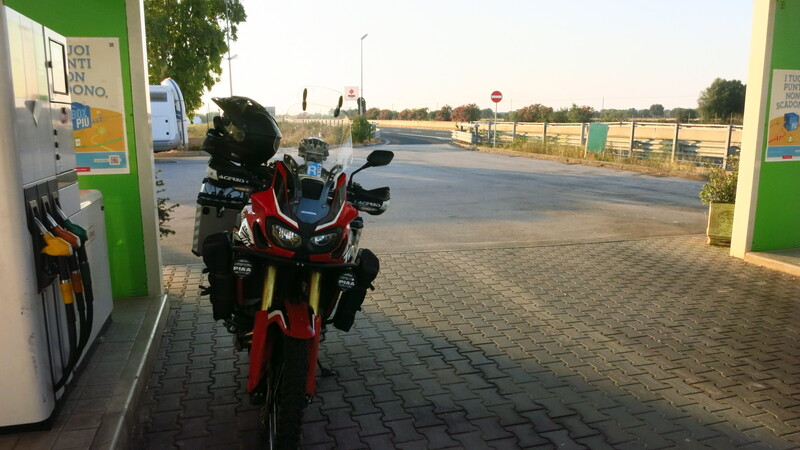 This entry was posted in Balkan Adventure 2016, Travel and tagged Autostrada, Brindisi, Civitavecchia, ferry, Grimaldi, Honda CRF 1000L, Italy by Kilian. Bookmark the permalink.